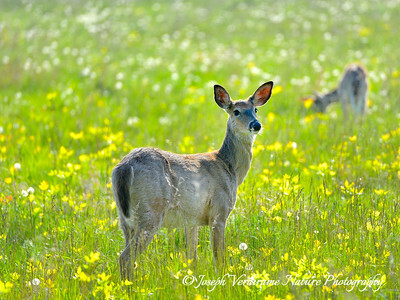 What to say about ungulates, the members of the deer family? 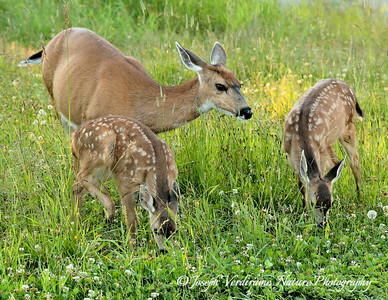 Deer, moose, elk and other members of this family strike a chord with many nature enthusiasts. I suppose everyone loves Bambi! As gentle as many ungulates appear to be, it seems that more people in North America are injured every year by ungulates than by carnivores such as cougars or bears! Moose, elk and bison in particular can be very temperamental and territorial - caution is always in order when photographing these creatures! 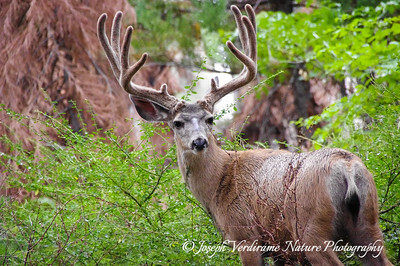 A Mule Deer buck with antlers in velvet stands proudly in the giant sequoia forests of the Sierra Nevada mountains in central California. 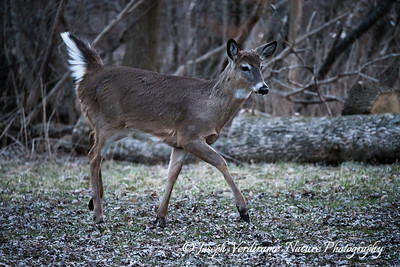 This young deer was out for some early spring browsing one evening and struck a perfect pose for me. 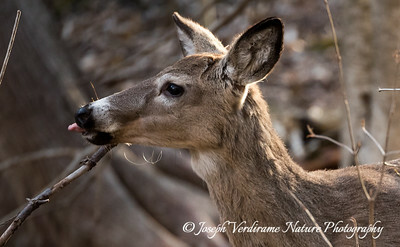 This deer must have found something very tasty. 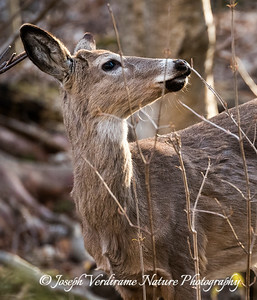 This deer seems quite accustomed to posing. This young fellow looked like he enjoyed rubbing his snout against the vegetation. 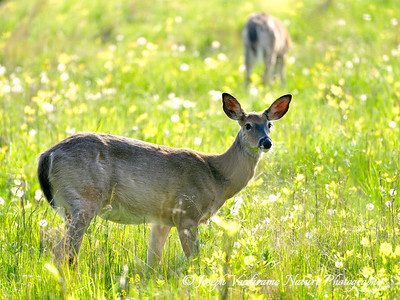 This deer keeps a watchful eye as another member of the herd grazes in the background. 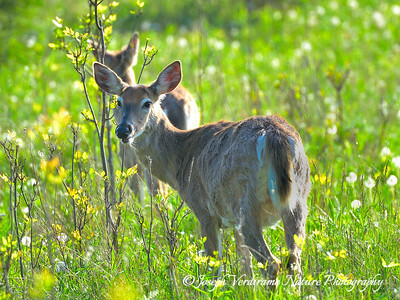 These members of a small herd in Ontario obviously found some tasty morsels in this meadow. 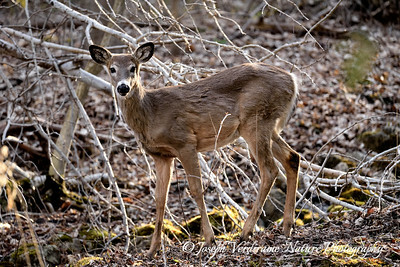 This doe was watchful as the members of her herd grazed peacefully on a lovey spring afternoon in southern Ontario. 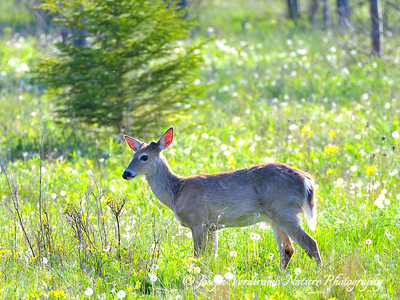 A young white-tailed deer in a typical rural Ontario scene.. 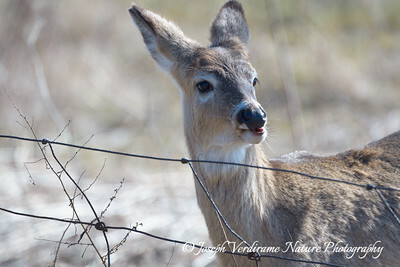 This doe is raising its tail to warn other deer of possible danger, typical behaviour for white-tailed deer when alarmed. 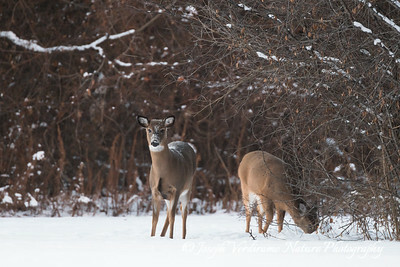 Deer are remarkably resilient to winter weather, provided the snow does not become too deep and hampers their ability to find food. 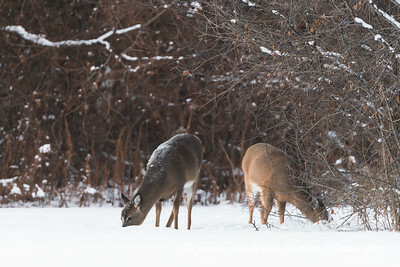 This alert doe is likely foraging with her fawn of the year in cold winter weather. 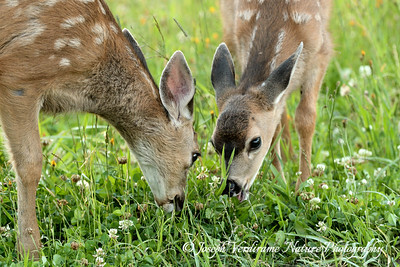 A Mule Deer doe and her twin fawns grazing peacefully in British Columbia. 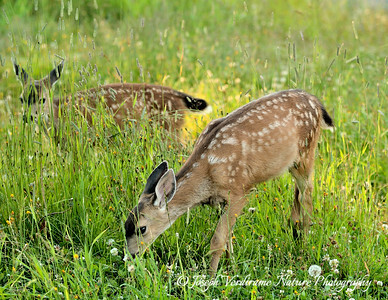 These two siblings in British Columbia don't seem to mind sharing the "green, green grass of home' with each other. 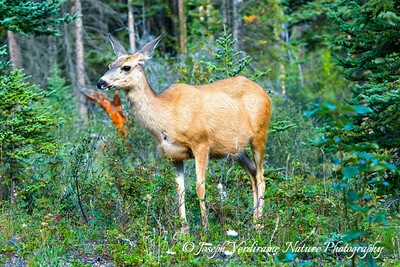 This female Mule Deer seems to be enjoying a sunny summer day in Banff National Park. 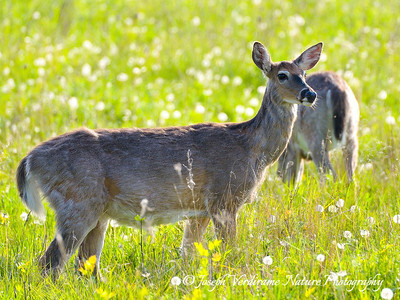 This Mule Deer doe is seen delicately grazing on wildflowers on a summer afternoon in Banff National Park. 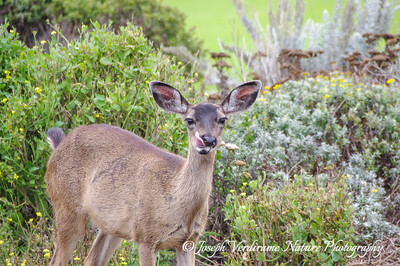 A female Mule Deer relishes some fresh vegetation on the California coast near Monterrey. 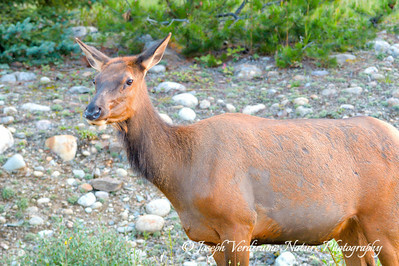 This cow Elk is out enjoying the first light of a summer morning in Jasper National Park. 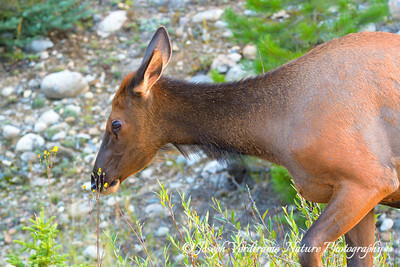 This cow Elk is enjoying wildflowers on a summer morning in Jasper National Park. 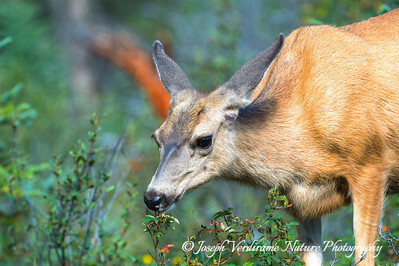 This young Elk is in Jasper National Park. 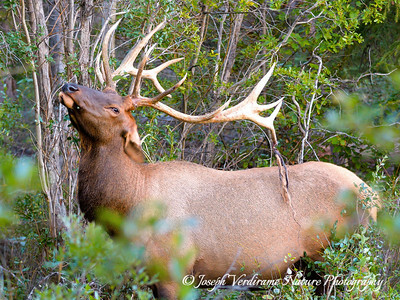 This large bull Elk is browsing on summer foliage in Jasper National Park. 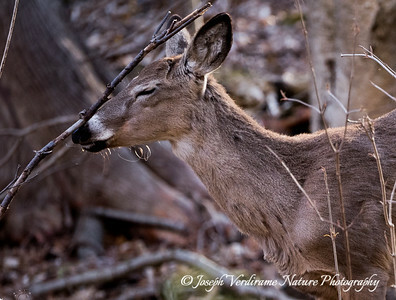 Note the velvet (bloodied skin) hanging off the rearmost tines of his new antlers, as he polishes and shines them in preparation for the year's mating season by rubbing them against branches. 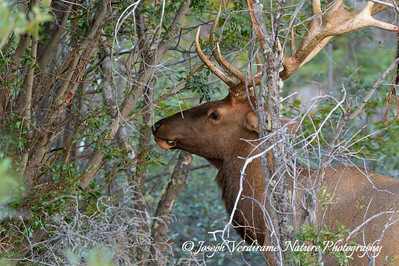 This large bull Elk is browsing on summer foliage in Jasper National Park. . 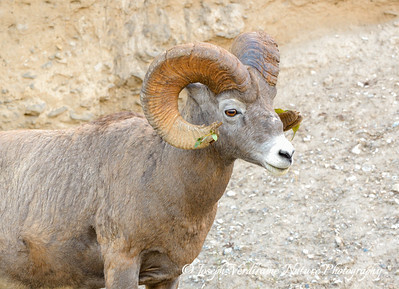 This male Bighorn Sheep (ram) shows off his well-used horns, complete with some pesky foliage that just won't fall off. 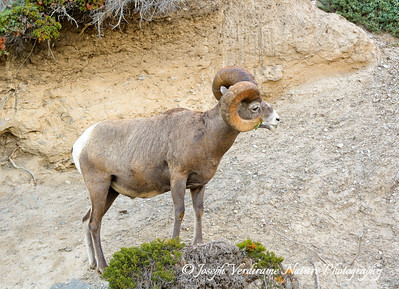 This Bighorn ram is seen on a mountain slope in Jasper National Park. 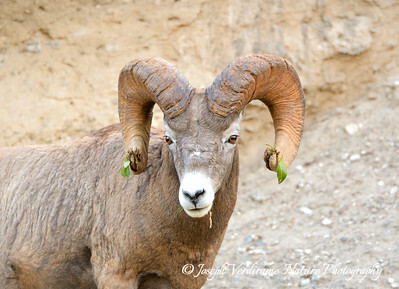 This big fellow in Jasper National Park almost seems to be challenging me to a head-butting contest. Note the foliage in his horns...he's been feeding on some thick vegetation. 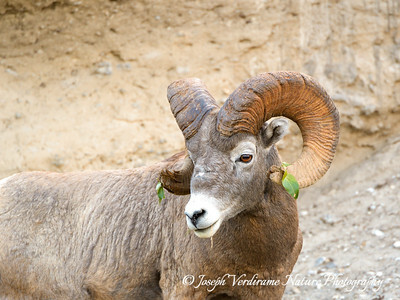 This Bighorn Sheep Ram struck a great pose for me in Jasper National Park. 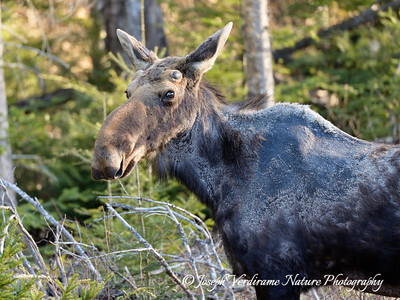 This bull moose in Algonquin Provincial Park has been suffering from winter ticks, as shown by his damaged coat. Unfortunately, this is a growing problem for dwindling moose populations in many parts of North America, due in part to climate change. 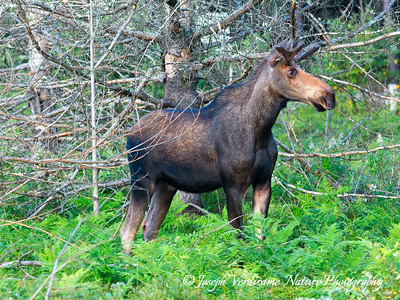 This young bull Moose was out for some early morning grazing in Algonquin Provincial Park. 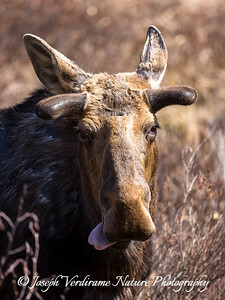 This seasoned bull moose seems to be licking his lips over some tasty morsel. I don't think he's sticking his tongue out at me, is he? This older bull's antlers have already started growing by early spring. 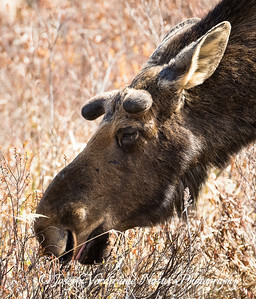 A bull moose very delicately samples some spring vegetation. 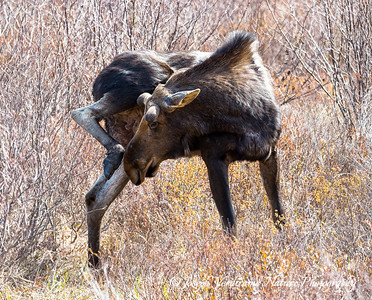 A bull moose takes a moment to relieve an itch while enjoying spring vegetation in Algonquin Provincial Park. Bull Moose - what are you looking at? With his look, this bull moose almost seems to be saying, "what are you looking at?". 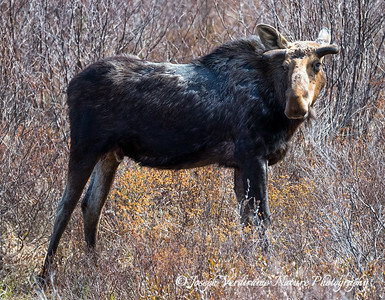 A seasoned bull moose takes a breather from grazing spring vegetation in Algonquin Provincial Park. 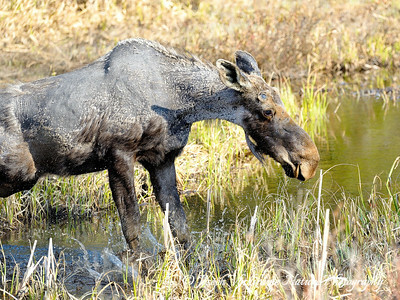 This cow Moose is knee-deep in a bog as she browses on vegetation in early spring. 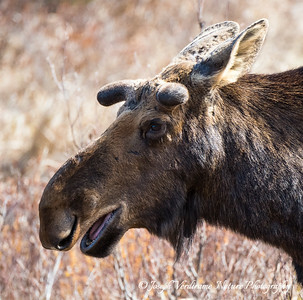 This portrait of a bull moose in early spring illustrates why many consider the moose one of the most awkward-looking creatures in North America. However, they say that beauty is only skin-deep! This young bull moose makes a bit of a splash as he crosses a creek in early spring. 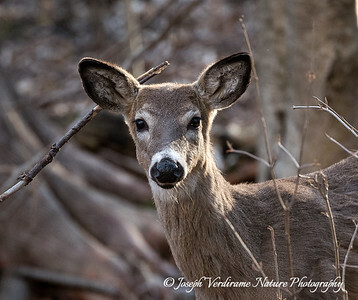 This young fellow is already showing some antler development in this spring portrait. 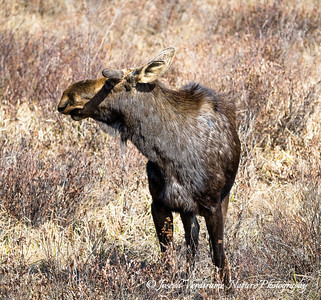 A profile of a young bull moose in early spring. This healthy-looking cow moose was out for some early morning browsing. This cow moose and her calf were quite curious and struck an interesting pose for the camera. 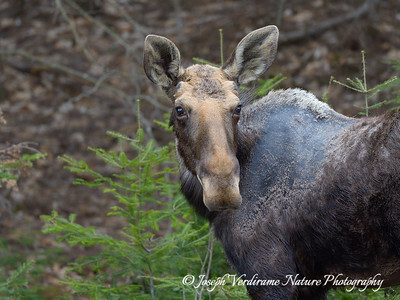 This young bull moose seems to be suffering quite a bit from winter ticks, judging by the condition of his coat. A young bull moose takes an evening drink in Algonquin Provincial Park.